Welcome to your sales weekly roundup for February 24-March 3. This week we’ve got the latest from HBR from CEB’s finest, End-of-Pipeline-Management Advice from Princess Leia and why business executives need to join the conversation on digital. Enjoy. Suppliers that make buying easy are 62% likelier than other suppliers to win a high-quality sale (premium offerings). So what are the prescriptive tactics that help customers decide how and what to buy? Rather than employing what CEB calls a purchase-from-us journey (a focus on the vendor's process and offering), B2B marketing executives should take on a more agnostic journey approach. In the awareness stage, this means creating content around whether there is a problem, prioritizing competing business challenges, etc. 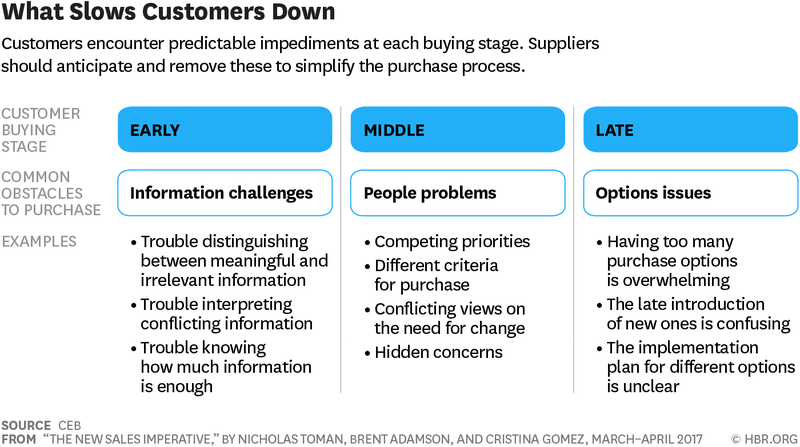 In the consideration stage, this means the “how” part of the journey: “build-versus-buy options, technology-versus-people solutions, and the implications of integrating various solutions with existing systems.” In the decision stage the customer considers different suppliers The last stage is, most likely, where the customer contacts a sales rep. Early stages: information-based challenges such as drawing clear conclusions from often conflicting data or recommendations. Late stages: Implementation plan (pilot vs large-scale rollout), ROI, product options. inability to agree on a specific plan for implementation (such as a pilot versus a large-scale rollout) or a disagreement about the ROI of various product options or configurations, such as on-premises vs cloud-based CRM. Prescriptive efforts must meet three requirements, say the authors. Facilitate progress along a purchase path leading to a solution that the supplier is uniquely able to provide. 1) They require active participation—customers must take clear steps confirming that they’ve committed to advancing the purchase process. 2) They are binary and objective, minimizing the potential for misinterpretation—the customer either did or didn’t engage in a diagnostic, commit resources, or approve next steps in writing. 3) They signal at each step a customer’s deepening commitment to moving away from the status quo. Verifiers range from the fairly general, such as acknowledging the need for change, to the explicit, such as signing a contract. Sales acceleration research analyst Bryan Parry studies the sales behaviours of 151 companies across more than 2 years’ sales pipeline data and has found staggering results. Although salespeople close almost triple what they usually close on an average day, the deal size is dramatically lower. More deals: What if you didn’t drop the win rate on the last day of the month? The average win rate for most of the month is 66.56%. What if we hold all other variables constant and raise the last-day win rate of 33.21% to what it is the rest of the month? This has the potential to double end-of-month revenue (100.55% increase). More, bigger deals: What if you didn’t drop either metric on the last day of the month? With the higher win rates and deal sizes from earlier in the month, you could really improve things. In fact, based on our calculations, revenue could increase 184.98% under this hypothetical scenario. Humanize your content and be your organization’s conscience. Be real. “Corporate speak” seldom works on a platform such as Twitter. Share important content in everyday terms that speak not only to the bottom line but also from the heart of your organization. Engage with partners and peers. Online communication is best when it’s a two-way dialogue. Actively seek out your industry colleagues. Join conversations and start new ones. Connect with employees. Remember that Twitter can be an effective tool for both internal and external communications (your staff is on Twitter). Being transparent with the outside world sends a powerful message of inclusion and openness to your staff. Inspire the next generation of business leaders. Twitter skews young and is well indexed to Canadians in the millennial demographic. Take time to engage, field questions and share knowledge with the next wave of executives.